The Buchkantine has an extensive lunch and dinner menu, as well as cakes, coffee, juice and teas. Sit alongside a bookshop full of old and new releases for young and old. There is a children's room for the little ones to play in and read books already there for their pleasure, within a room full of kids books to buy. You just have to watch their sticky fingers on the stock! 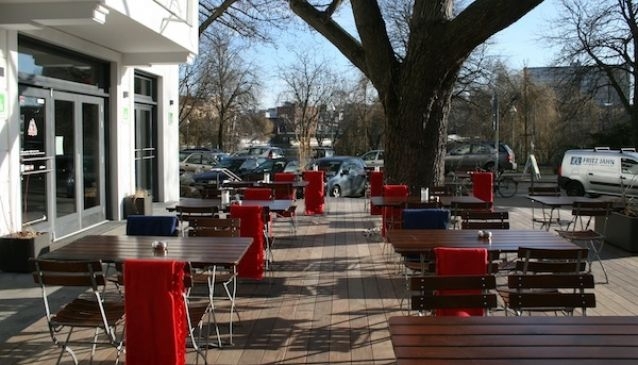 During the warmer months there is a great terrace where you can sit and dine under the trees, although, inside is quite delightful too so you have something to look forward to if the weather turns chilly. On Sunday evenings locals head to the Cafe for their screenings of the television detective series 'Tatort' which is somewhat of an institution in Germany.